KEEPER<sup></sup> Performance Engineered<sup></sup> 8' x 1-1/4" Diamond Series Power Sport ratchet tie-downs meet the requirements of medium cargo transport. Sewn-in soft ties keep hooks away from chrome and paint. With a working load limit of 800 lbs. and 2,400 lbs. break strength, these tie-downs also deliver wider 1 1/4" Hi-Test<sup></sup> webbing and comfortable moulded rubber straight Diamond Grip handles. Full size vinyl coated S-Hooks with latch attach quickly. Extended short ends reach in-bed anchors for added security. 2 pack. With its strong, bendable wire interior and durable, ridged rubber exterior, the 24 inch. Gear Tie Loopable Twist Ties grip, wrap, and secure most large items - like hoses, tarps, and outdoor gear - hundreds of times in hundreds of ways. The added feature of an integrated loop on one end allows you to thread the other end through it and pull to cinch and organize nearly anything. Then twist the other end around a handle or anchor point. You can also use the loop to hang it from a small hook or tie a line through the hole for quick connections. The configuration possibilities are as endless as the number of little things it will organize, hang, connect, attach, and carry for you. Gear Tie 18 Inch. 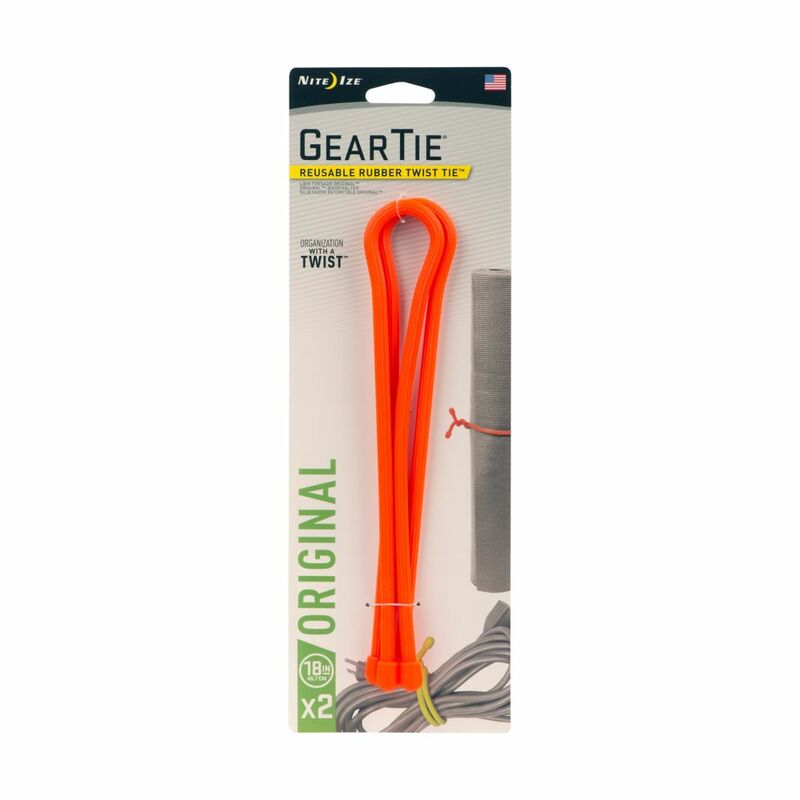 2-Pack Bright Orange The 18" Nite Ize Gear Tie is the perfect size to wrap and organize medium-to-large appliance cords and wires. Keep your jumper cables, extension cords, dog leashes, and larger electric cords neat and untangled with a quick simple twist. The 18" Gear Tie is also great for looping and hanging lightweight tools and lanterns - and reusable nature makes it easy to reposition and adjust conveniently. Available in packs of two. Gear Tie 18 Inch. 2-Pack Bright Orange is rated 4.6 out of 5 by 14.